Power-Con 2018 was this past weekend and I got a few things! Since I haven't gotten around to writing up stuff from the previous years let's add those in and do a whole theme here of Power-Con exclusives! 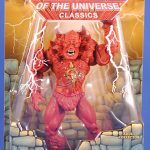 For those not in the know, Power-Con is a small convention in Los Angeles that is focused solely on Masters of the Universe. It's a neat show with a handful of dealers and exhibitors in a ballroom, a room with a handful of panels and a whole bunch of cool fans and online friends flying in from out of town - so really you go to see your friends you can't regularly hang out with, and then stay for dealer room and panels. Over the years they've managed to get an increasing number of exclusives, which is the other big draw for me, so let's take a look at some from 2019, 2017, and 2018! This guy was the Horsemen's first exclusive for the show (and might even have been the first Mythic Legion to get in to people's hands?) back in 2016 and he's damn cool. I've also had a "thing" for Man-at-Arms and this repaint nails the aesthetic remarkably well. His armored boots, gauntlets, torso and left arm all feature the signature orange coloring and get a subtle dark orange wash to really bring out the details in the sculpt. 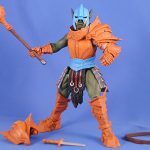 His thighs, right arm and head are painted a dark orc green while the belt and helmet get that Man-at-Arms sky blue color (with some gray and silver weathering. 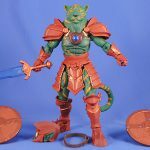 He comes with a removable armored collar, two removable pauldrons (and looks good with both but I think only using the left one better homages the MotU character), a wooden staff that connects to a mace head, a little dagger and the standard brown belt. Sadly, the staff for the mace is a little too thin for him to hold tightly (really, 4h? That seems like it would have been such an easy fix). Articulation is pretty thorough with balljoints just about everywhere, but the shoulders are a little tight and the wrists pop out ridiculously easy. 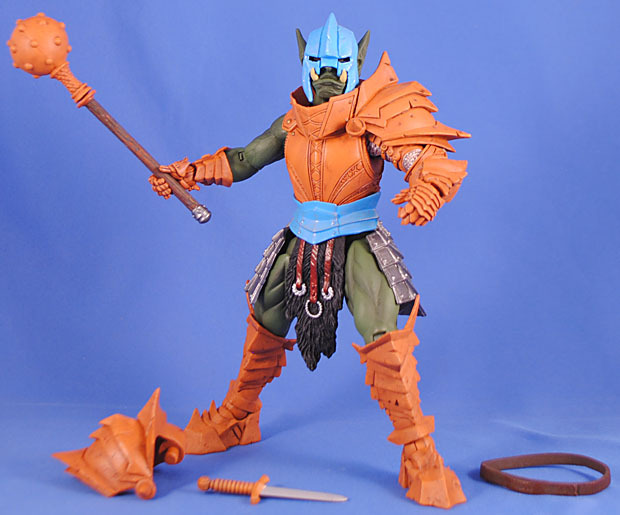 It's a cool figure and it works really well both as an homage and as a cool orc. 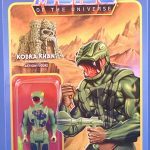 This is easily my favorite of all the MotU homages! In 2017, they did the "lynchpins" to whole sub-theme and first up is He-Man here. It's not great but it's pretty good considering they're just working with what they had. He uses the bearded, braided barbarian head and while I know it's bothered several people for being so off-model I actually kind of dig it - obviously it's the only un-helmeted human head they have but also it suggests an older, more battle-weary He-Man. The costume is recreated as best they could but obviously it's a bit of a stretch. It does bug me that they used the angular, evil Orc armor for the boots, though. Using the Knight armor seems like it would have been more appropriate. The easiest part of the homage is the chest harness, made hear from two of the belts (painted gray) overlapped. It's okay but doesn't really work all that well. He comes with the giant axe (with swappable blade and spike), which does seem like one of the very few good uses of that accessory. He also gets a shield, which was clearly intended for this homage and a standard Mythic Legions longs sword, which seems a pretty poor stand-in for the Sword of Power. Finally, we get an alternate head sporting a bucket helmet and a removable golden eagle topper. It's a nice thought but it weirdly is a very loose fit on the neck's balljoint and wobbles loosely, plus who would really want a helmeted He-Man? I wish they'd just spent the money on tooling up a new sword or chest harness. 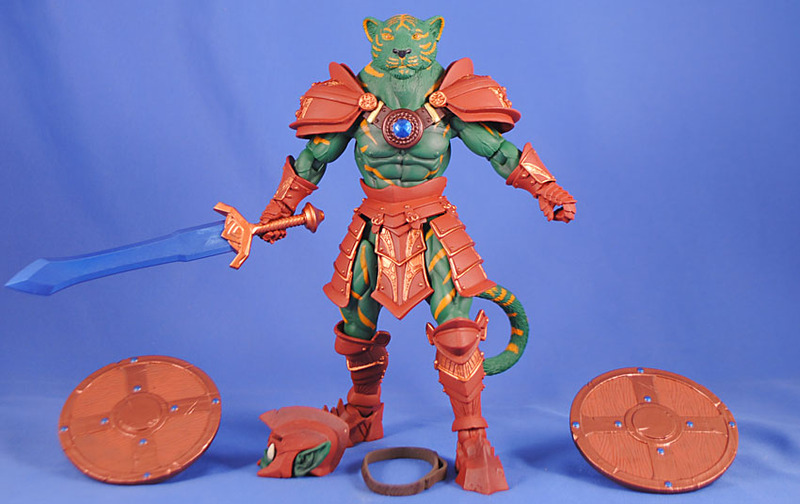 Maybe it's a result of He-Man just being a bland design, or just that 4H doesn't have a parts library that can really recreate the 'Man, but (despite quite liking the head here) I gotta say this guy is the weakest of the five homage figures - a real shame since he's the heart of it. The Four Horsemen are great at designing, sculpting and painting action figures - but man are they weak at naming them! Cletus here is one hell of a snappy looking figure! The armor is a dull, silverish purple with a black wash, and black'n'bronze highlights. They gave him the skeleton body so his bony arms and legs are a fitting dull blue. It makes sense and looks fine, but Skeletor isn't a skeleton so it's weird and a bummer that they didn't use the regular arms and legs. Cletus comes with a ton of accessories - he gets a long sword, done in a great two-tone purple scheme, and a matching dagger, one of the tall staffs (aggravatingly done with a sloping shaft making it really tough to have the figure keep hold of since its bigger than the hand grasp, and bigger at the top and narrower at the bottom so it naturally wants to pop up or out) with the pointy staff-head. Not to mention removable pauldrons and a spiky collar. 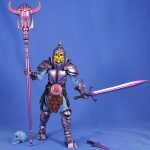 What's most remarkable is that there are three heads here - the basic skull, in blue to match the arms and legs, a battle helmet with horns in metallic purple (meant to pop on to the staff to suggest the havoc staff) and then the signature repaint of the armored skull head done in purple cowl and Skeletor skull face. I had really hoped to do sort of mash up this guy with the yellow-green and purple skeleton (Scaphoid? Ugh, these gobbledigook names...) but the purples on him are way darker than on this guy, and the Skeletor face paint is way too flat to match the standard Mythic Legions style, so... ta-dah. It's really the painted-in eyes that make this skull so unique and makes the ones that have come before such a poor fit for this guy. 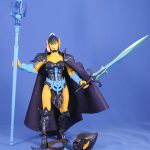 I wish they'd just repainted the blue skull yellow and green and gave him Skeletor eyes too (and honestly I'd have preferred a metallic purple skull for the staff rather than the helmet). But despite my griping, the more time I've spent with this figure the more its grown on me as the homage and it really is beautifully deco-ed. When they unveiled this Evil-Lyn homage, it seemed to have been met with a resound "oh," and that was certainly the reaction at the con - Battle Cat sold-out fast but they had stacks of Evil-Lyn out afterwards till the end of the show. 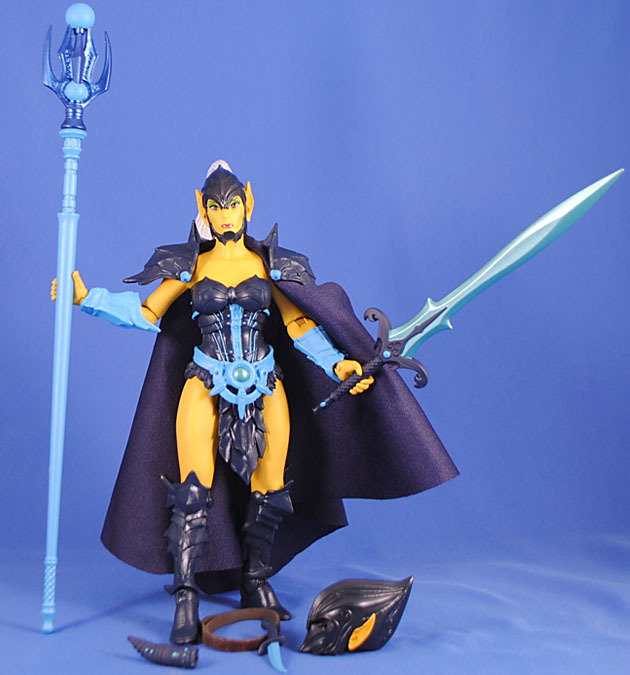 The figure is fine, but Evil-Lyn has always seemed like a tricky one since they recolored her for Mo2K my perception has always been that people have a "one or the other" preference, and the colors on this figure are just so... strong. At least, they photograph that way - she does look better in person. Her armor is a really dark blue that practically reads as black unless she's in your hand and that clashes too harshly with the bright yellow skin (though, again, not so bad when in hand). The sky blue highlights are really nice but they are pretty flat and the armor in general lacks the washes and weathering that makes the early figures look so since. She comes with the standard staff and belt (which is pointless here, and they couldn't have at least paint it blue or something to match the figure?) as well as the new sheath and dagger, elven sword, white ponytail for her head and an alternate elf/vampire helmeted head. She comes with a big cape that remains difficult and confusing as towards how it should be used. There is a single diamond cutout suggesting it's for the neck but what I've tried here is stretching it out so that the pauldrons plug into that diamond hole. It looks good but takes a lot of finagling. Also - she's a she which means this is the first hands-on chance we've had with the new 2.0 bodies and the results are... okay. Aesthetically she matches the look of the line really well, and interestingly rather than having the balljoint for the head as part of the sculpt the ball is a separate that plugs in to the neck. Her hands are smaller than the 1.0 bodies which is a big problem for the staff, which really stretches out her hand. Her ankle joints are also kind of weak and I've found it tougher to keep her standing than any of the others. One hopes this is just an issue with this run of figures - I sank a lot of money into that Kickstarter and it's foreboding that this figure is at best on par with the 1.0, rather than a marked improvement. 2016 was the first year, I believe, that Power-Con got exclusives and the two standard figures were Camo Khan and this guy. 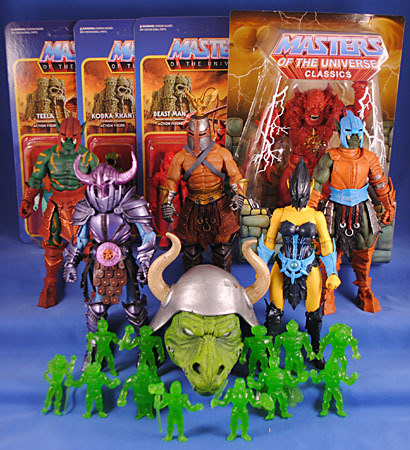 I'm not a big enough Masters of the Universe fan to really "get" or have an attachment to these figures, but I bought the whole set for $250 out of enthusiasm for the show. I ultimately traded or sold Khan to a friend, but this big ruddy beast is a fun reminder of my first year of attending Power-Con. 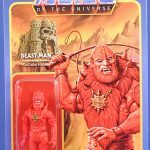 It's just the original Beast Man figure, but cast all in red plastic and he actually has a more complex and subtle amount of paint on him to bring out the details and add variation to his armor. It's a pretty neat figure, despite his rather bland and boring look. I'm leaving him carded for the memento-ness of him, and I wish they'd added a Power-Con exclusive sticker to him or something. Plus, he cost me $45. Yikes. You gotta treat something like that with some degree of respect and import in the collection. The main reason I got the figures at 2016 Power-Con was to get this guy. 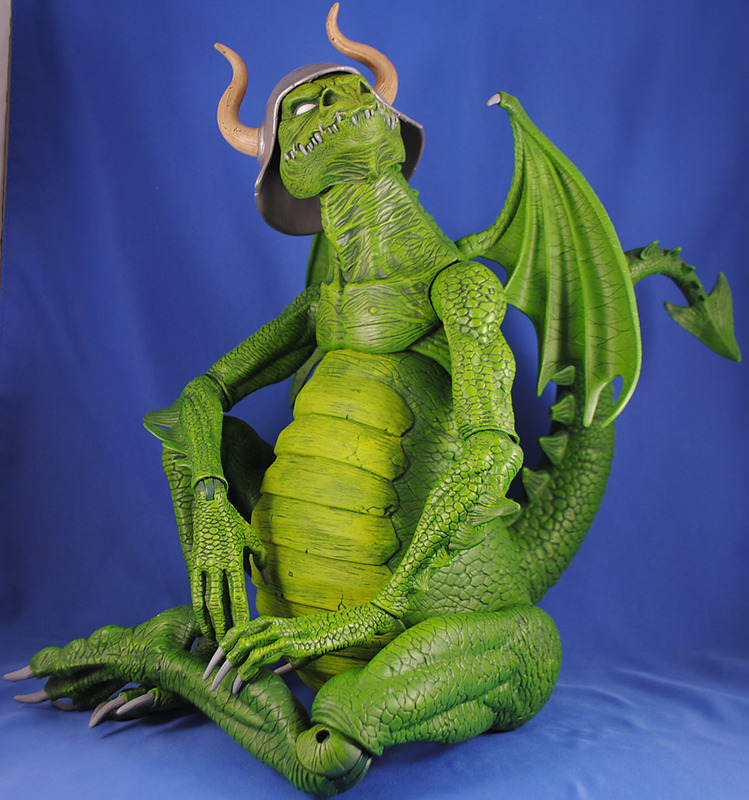 I'd passed on the original red Granamyr and had kind of regretted it so this was a great "bonus round" and, especially since I'm not married to the source material, think he looks much cool in green than red! The sculpt is really nice and the paint is kind of basic and broad but given the scale of the figure it works pretty well. He has an awesome classic '80s fantasy vibe to him and is much more fun looking in-hand than I'd expected. I really do wish they'd made the helmet removable and it's a weird design choice and feels anachronistic, but it's okay I guess. My biggest concern was that they sculpted his belly to keep him sitting so he looking super awkward when standing. However, there is good enough motion-range on his ball joints that you can mix up the poses a bit and get some fairly subtle ones. A really nice touch is that his arms, legs, head, wings, torso and tail are packaged separately and they unplug fairly easily too, so if, like me, you run out of space, you can pack him back up to keep and safe and tidy. This is a really wonderful figure, and he's quite large in person so while I balk at the $45 I paid for Red Beast Man and Camo Khan, I'm actually kind of okay with the $160 this guy cost me. 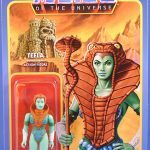 Each year Super7 has sold a full set of that year's "M.o.t.U.S.C.L.E." 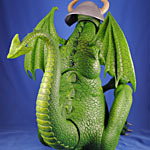 figures in exclusive-to-Power-Con translucent green plastic. It's a fun idea but I've never been big of mini-figs and at $25 per can I've sat out 2017 and 2018, and in fact only just opened these now for this review... but I gotta admit they're cooler than I kinda thought they were and you get, like, 10 of them so the price doesn't seem too terribly bad after all. 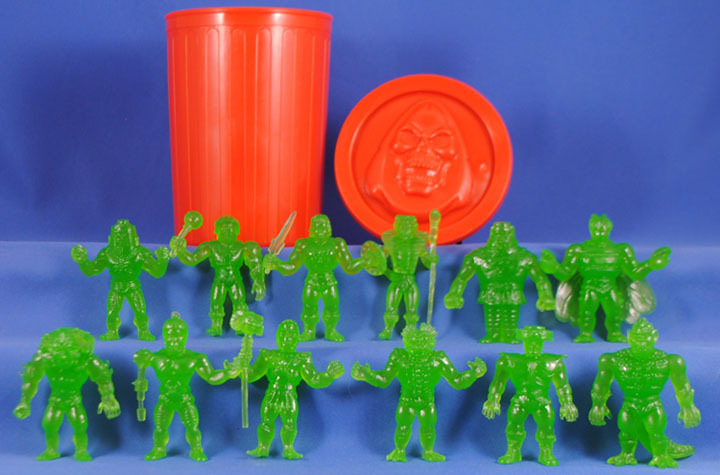 They come packed in a red trash can with a relief of Skeletor's head on the lid. 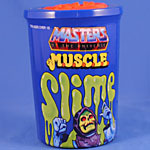 The whole thing is shrink-wrapped in plastic that has the slime graphic on the front and, awesomely, the Power-Con logo on the back. I really, really wish the graphics were permanently printed on the can or that they were shrink wrapped on there and then a separate shrink wrap was over it to hold the lid closed because those graphics really help make the set and can special. The sculpts are all pretty good but the majority of them have trouble standing. This is the only series in this slightly more realistic aesthetic, everything afterwards is more cartoony like classic M.U.S.C.L.E. figures, so maybe it's no so bad that I only have this set. 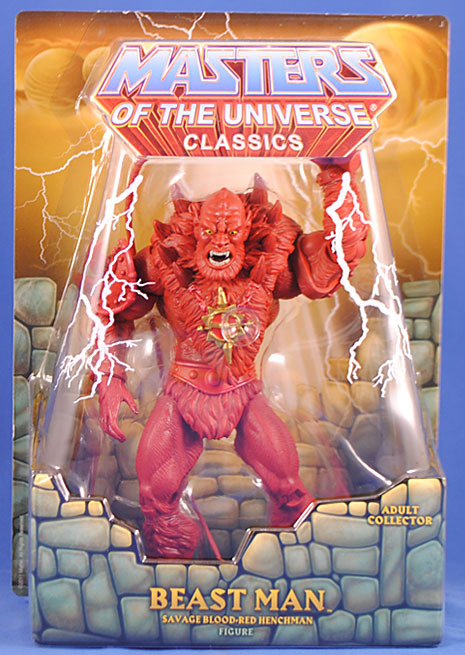 I skipped the Super7 MotUC exclusives last year because I just couldn't get interested enough in all three figures of the two three-packs, and while the Orkos were kind of tempting, I'm not really a Filmation fan so I sat out this year's. As a result I was pretty jazzed that Super7 brought some ReAction reprints because those are much more my speed. I grabbed this guy to go with my MotUC version, and he's fairly similar. 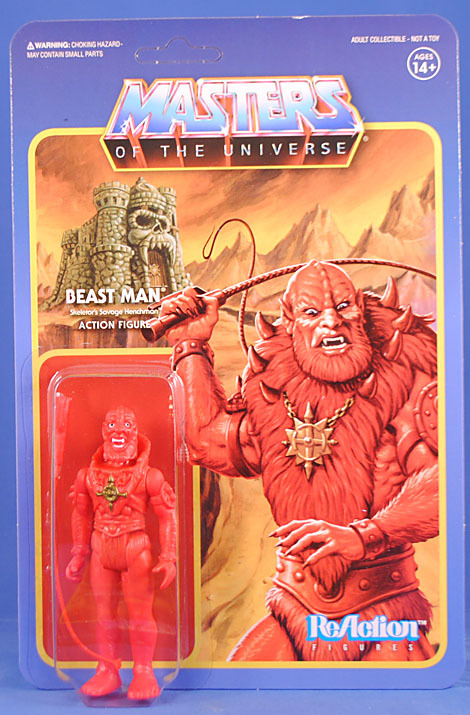 The standard Beast Man just cast in red plastic and a few paint hits for the face and medallion. 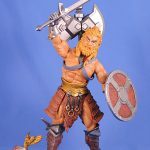 He doesn't have as much or as complex/subtle paint as the MotUC version, but as a $15 ReAction I don't think he should. This was the one ReAction exclusive I wanted outside of homagery as the Green Goddess just looks cool, plain & simple. 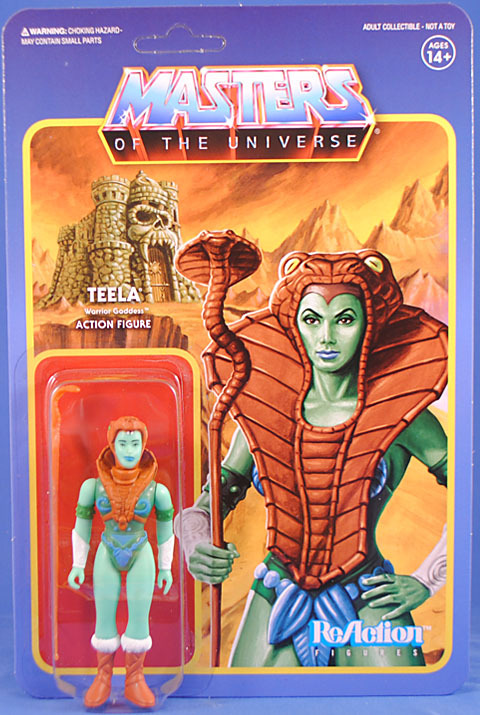 She's a straight up repaint of Teela and looks pretty darn good here. She's cast in a subtle mint green plastic then has a couple shade of green paint for her outfit and then brown for the armor. I'll probably end up opening her but just couldn't pull the trigger on that quite yet. I really appreciate that Super7 changed the character art on the front of the cards to match the repaints! But it's weird and a bummer that they didn't change the names, cardbacks or anything else about the cards. Like Beast Man this is another super fun, super meta homage figure, so I had to get as a 2018 memento of the 2016 show! 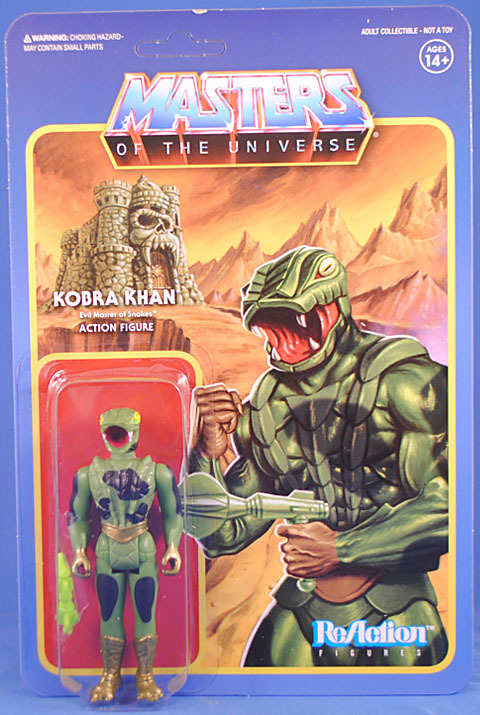 He’s a straight up pre-paint of the upcoming Cobra Khan figure and fairly good all things considered. I know some folks were bummed this guy lack his signature claw hands but I kind of like him more as just a simple repaint. This entry was posted in Power-Con, Rustin's Spoils of the Week and tagged He-Man, MotU, Mythic Legions, Skeletor. Bookmark the permalink. Regarding Cowarros' double shields - it's to simulate the discs that were on either side of Battle Cat's saddle (200x version). $45 for that red Beast Man is a steal. It's over $70 everywhere I've seen it. I'd love to get one that cheap. The photos of Cowarros on Store Horsemen show the head sitting higher on the neck than in your picture.